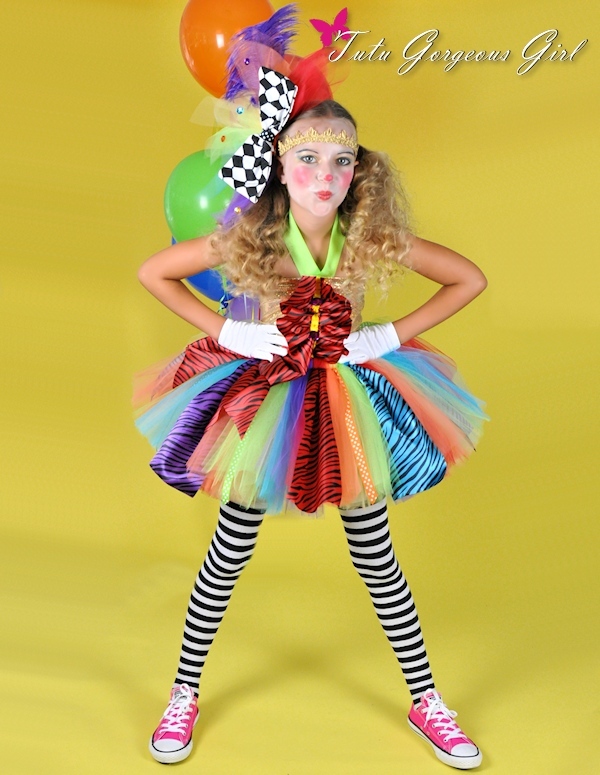 Outrageous and fun rainbow circus clown costume with tutu, headpiece and top for girls. 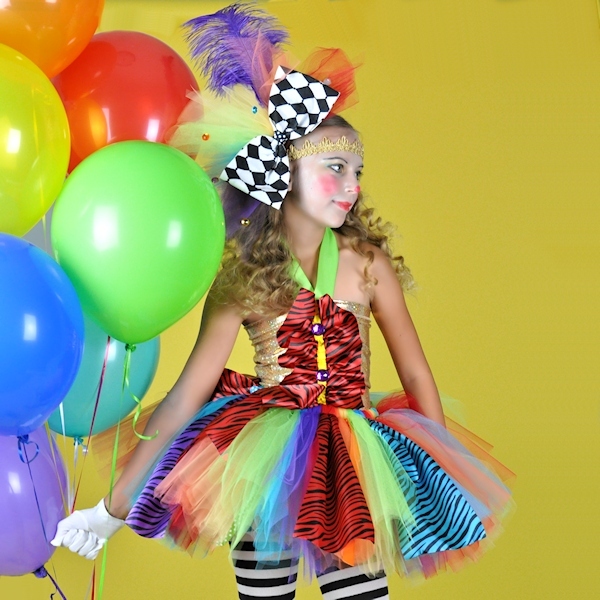 Under the Big Top clown costume features bold colors and prints for an outrageous and unique costume. The tutu is made with red, orange, yellow, lime green, turquoise and purple tulle, and is embellished colorful zebra print satin fabric and polka dot ribbon streamers. 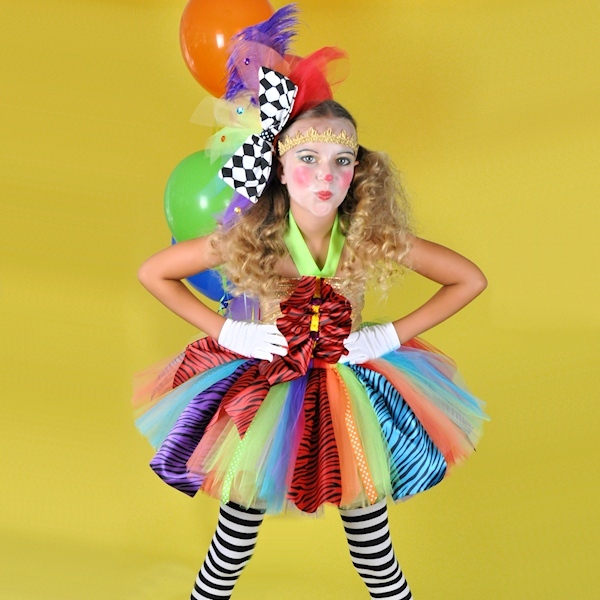 TUTU: Rainbow tutu with zebra satin fabric, polka dot ribbon streamers, and oversize bow clip at the waist. TOP: Stretch fabric tube top with red zebra print ruffle and embellishments. Top can be purchased in gold, turquoise or purple stretch fabric. Please select chest size in the menu. Measure under the arms snug all the way around the chest. OVER-THE-TOP HEADPIECE: Headpiece features large black and white diamond pattern bow, tulle spikes to match tutu, rhinestones, a giant ostrich feather (color substitution welcome), and gold metallic headband. Leave head circumference in your order notes. Measure by placing a tape or ribbon across the front of the forehead and measure all the way around. *Top, Gloves and tights are not included. You can find the gloves and tights at Party City. *Purple zebra fabric shown is no longer available. Lime zebra fabric will be substituted. (This costume requires a minimum production time of 2 business days. Please no 1 business day rushes).